I spent the latter half of my 20’s living and working in Des Moines, Iowa. These were years of mixed experiences. I secured gainful employment, began living on my own, and gradually grasped the expectations of post-college life and a professional work environment. This was also a time of testing boundaries, and learning through some embarrassing situations. Maybe that’s what it took for me to figure this whole adult business out – it seems so – but it’s always left me with uncomfortable memories about Des Moines. 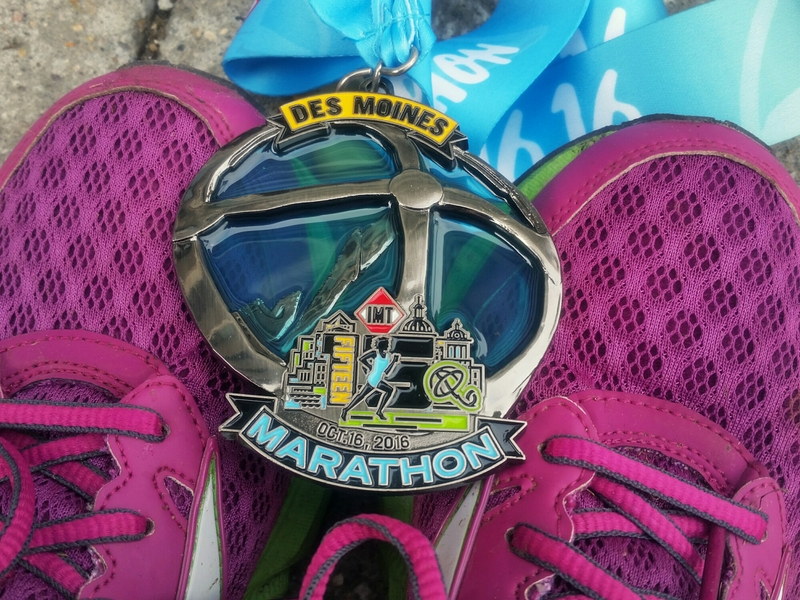 A visit to family in Iowa combined well with the 2016 Des Moines Marathon. I signed up, even though it occurred two weeks after Freedom’s Run Marathon. In the months leading up to my trip, I wondered what feelings would manifest during this event. 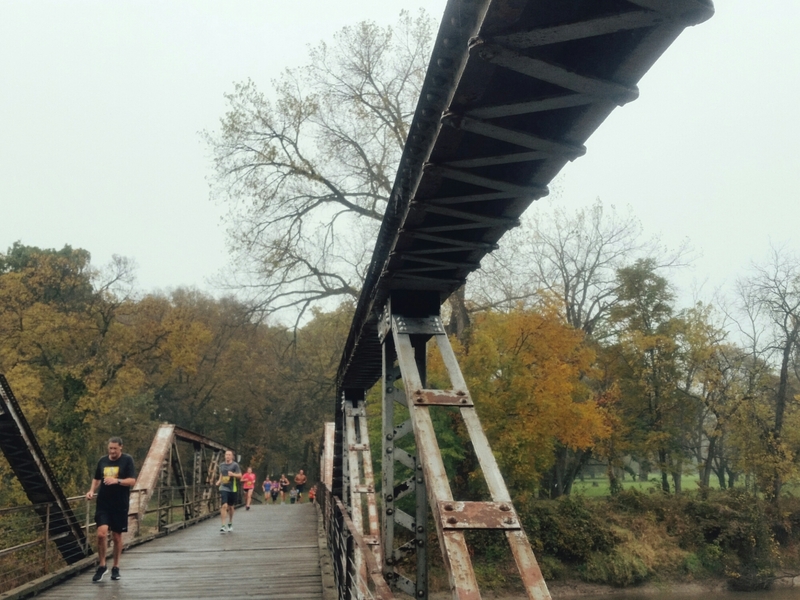 While running on Sunday, I happily realized that my years in Des Moines are more in the past than I knew, and the city now feels like a different place – one I can visit without negative recollections dominating my mind. 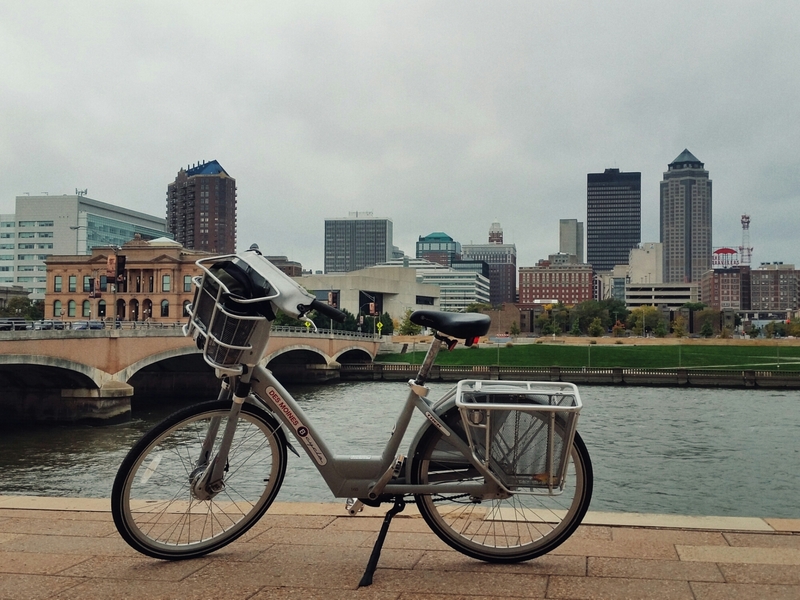 In addition to the amount of time gone by, the physical changes to Des Moines have also helped me experience it differently. Downtown has been developed to include more restaurants and residential housing, and a core street of the city has been significantly modified. 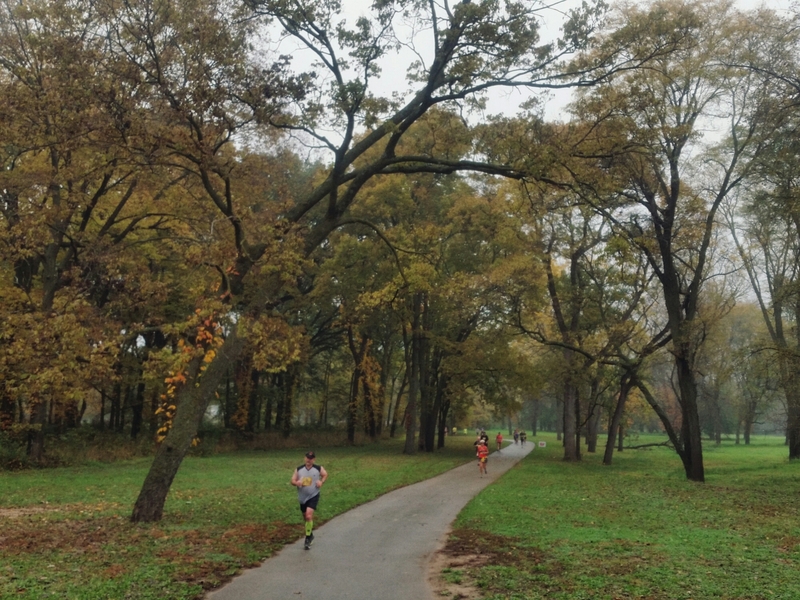 Des Moines enhanced its green space by building up Gray’s Lake, a lake and pedestrian park area that connects to an older city park – Ashworth Park I believe it’s called – and both make for divine fall running. Other areas have not changed, but time has faded them in memory and I see the city now mostly as someone passing through (though I still remember where the hills are!). All that said, Des Moines is a fine place to visit, and it’s a great location for a fall marathon. 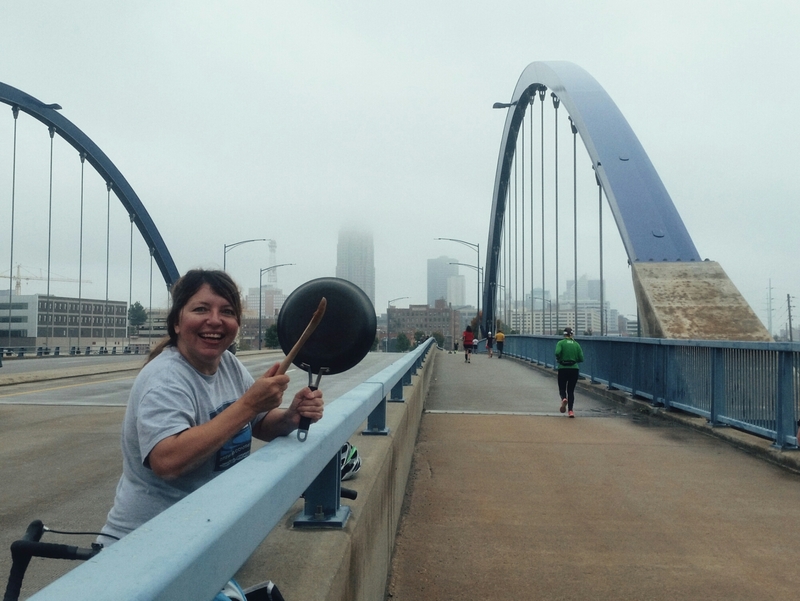 Less cowbell, more frying pan! The marathon course is consistently rolling, particularly in the first half, but the grades are nothing steep. For this edition the foliage had begun to turn, but leaves still clung tight to the trees. 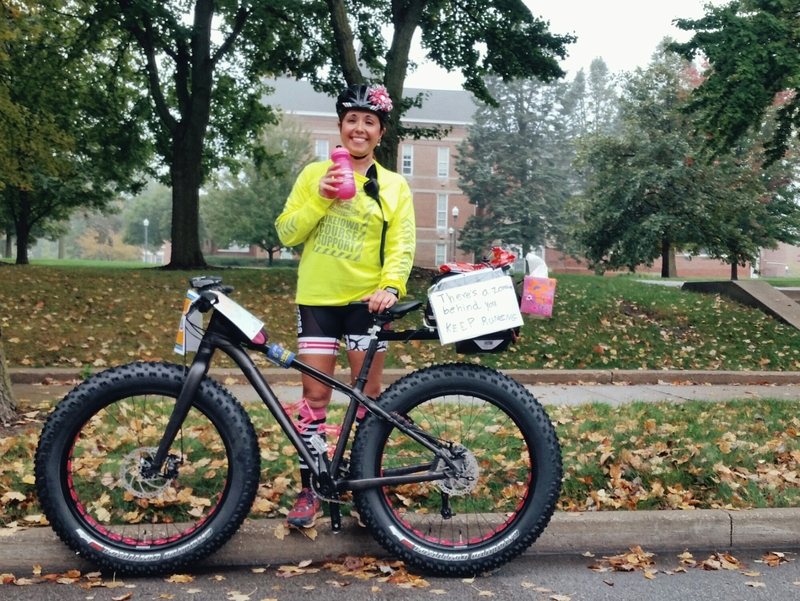 In contrast to something like the Marine Corps Marathon, there is plenty of place to move about. The course support is like nothing I’ve ever exerienced: water stops almost every mile (which actually seemed more than necessary); two stops along the route with oranges and bananas; and lots of spectators. I felt some Iowa pride about that. 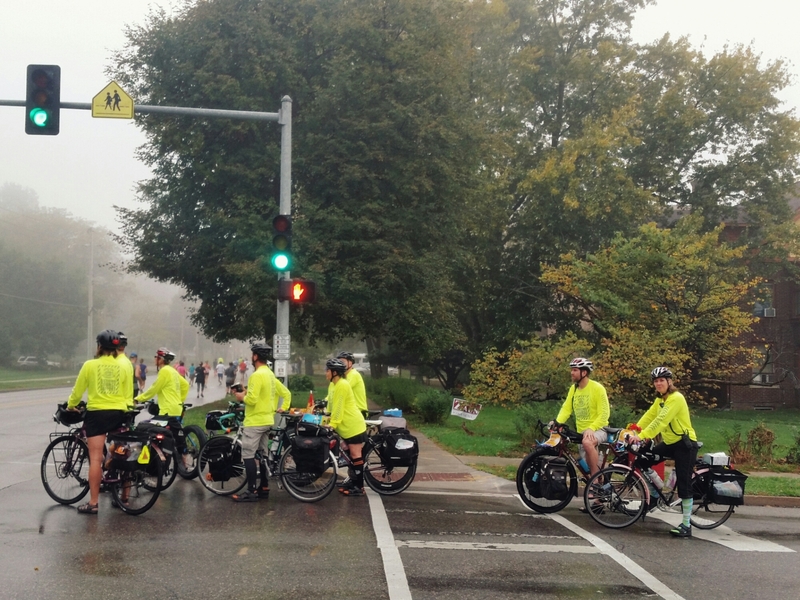 The Des Moines Marathon also uses BIKEIOWA support volunteers, who ride fully loaded along the course with snacks, tissues for runny noses, and other supplies. They thoroughly enhanced my run, both from a practical as well as aesthetic perspective. I saw a lot of lovely steel frames, fenders, and bags today. 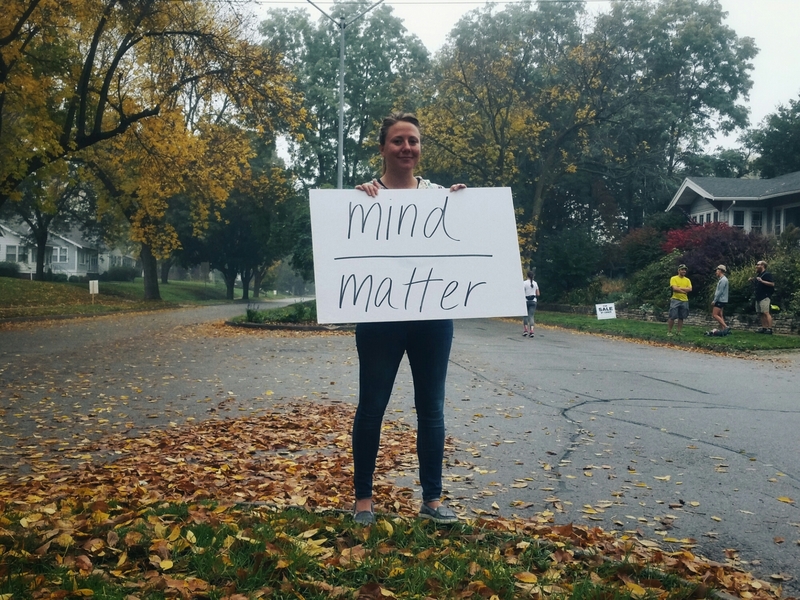 A spectator sign early in the run served as my marathon mantra – “Mind Over Matter.” Fatigue lingered in the legs from my earlier marathon effort two weeks ago, but I knew if I did not allow that too much space in my head – and as long as my legs kept turning over – I would make it. Maybe my mantra should have been “Matter Over Mind ” given my tendency to let my brain throw unnecessary monkey wrenches into my running, but the more traditional version worked while the marathon was happening. I took it easy, walking when necessary and taking photos along the way of this new Des Moines, and didn’t think too much about things. I focused on seeing the city as much as I could. My mom met me at the end (forgot to get a post-run pic of us, whoops!) and we walked off for breakfast. Well, she walked, I did something similar to walking that involved stutter steps and weaving. 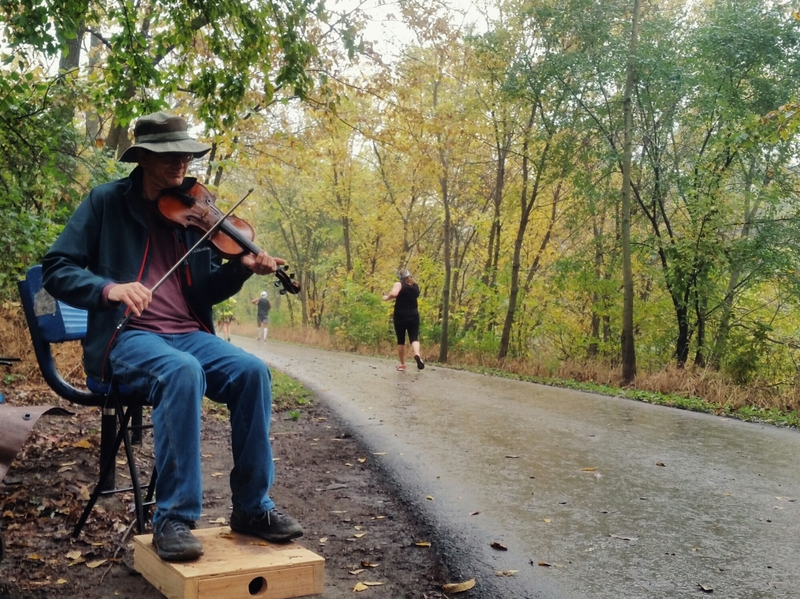 Today’s 26.2-mile tour of Des Moines on two feet proved cathartic. I would like to do it on fresher legs next time, but that’s a small detail. I saw so much positive about the city throughout the event, and my negative memories were nowhere to be found. I’m so glad I ran this marathon. A lot of familiar sites there from my “commutes.” Well, I’ve not seen the fiddler. That would be cool. Des Moines has been labeled by some magazine or other as the top hipster town in the U.S. That’s mostly the downtown area. A lot of pretty areas in Des Moines. Yes, it has definitely changed! Still didn’t see much activity downtown during the weekday, but Des Moines still has the BEST farmers market and they’ve definitely made it a livelier place in general over the years.